​In the ongoing effort to improve our offerings, we now have RaClips available to round out the Dock-It™ package. These marvelous little clips are discrete, easy to use, and are highly effective at preventing any unwanted sway in the bag-rack connection. Read more here. 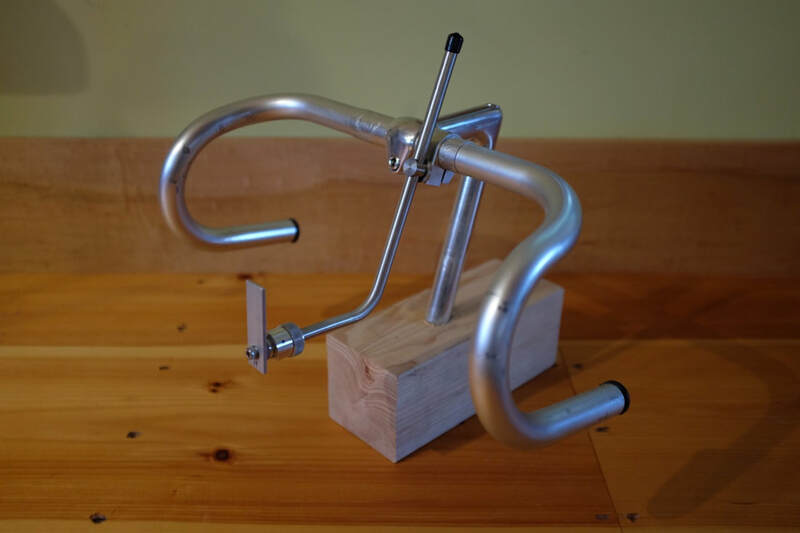 ​A decaleur is what joins a front handlebar bag to a bicycle. The Dock-It™ decaleur is an innovative new design that does away with previous limitations and opens up new possibilities. 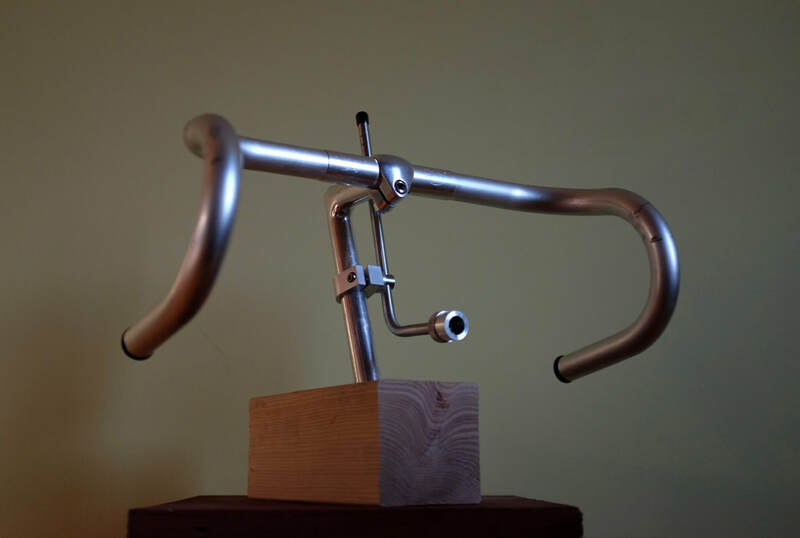 ​The decaleur has long been the forgotten add-on; a component that is rarely integrated into the overall bicycle. It is now receiving the attention it deserves. Combining function and elegant design, the Dock-It™streamlines the bicycle-bag interface with a simple and reliable docking mechanism, facilitating dependable, durable, and easy attachment of the bag to the bike. The Dock-It™ is a starting point: our products are aimed at skilled DIY'ers who are interested in configuring a custom arrangement and thus require a commitment to invest your skills and creativity to create a satisfying outcome--keep this in mind. How you integrate it on your bicycle is up to you, and we offer multiple options to help you achieve your vision. The Dock-It™ decaleur is defined by two principal parts: a rotary latching barrel (right in adjacent photo) and a small docking button (left in photo). 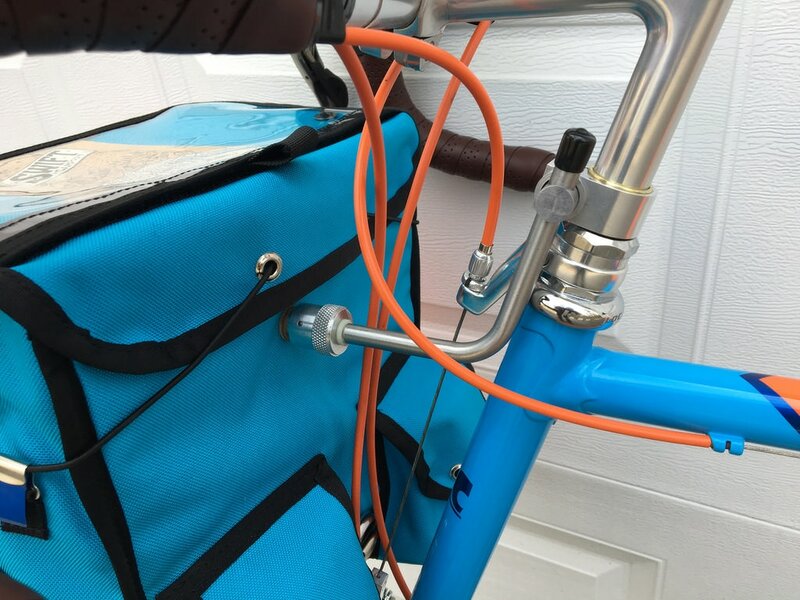 The barrel is joined to the bike, and the button to a front bag. ​Slide the barrel over the button, give it a quarter-turn, and you are docked! A robust tactile feedback mechanism confirms that you are latched onto the locked or unlocked positions. It's simple and easy to use. The Dock-It™ is a decisively strong connector. That said, decaleurs are intended primarily as stabilizers and the Dock-It decaleur should not be used as the sole means of keeping the bag fixed to the bike. The base of the bag should be secured in some fashion with any of the various bag-to-rack attachments methods. The best option is to use RaClips, a simple and easy connector available as an option when you purchase. Some bags may come supplied with velcro straps or some other means of creating a hold to the rack. Find the one that works for you in conjunction with your Dock-It™ kit. The best bag stability will be achieved when the Dock-It decaleur is integrated into the bag’s internal stiffener system. Internal stiffener structures vary greatly from one bag to the next, and your bag may already have what’s needed. If you have a floppy bag, you may need to do a simple upgrade, usually involving a bit of aluminum strap. The Dock-It™ Kit, as described above, is the essential mechanism at the heart of the decaleur, from which you will build-out your particular configuration. 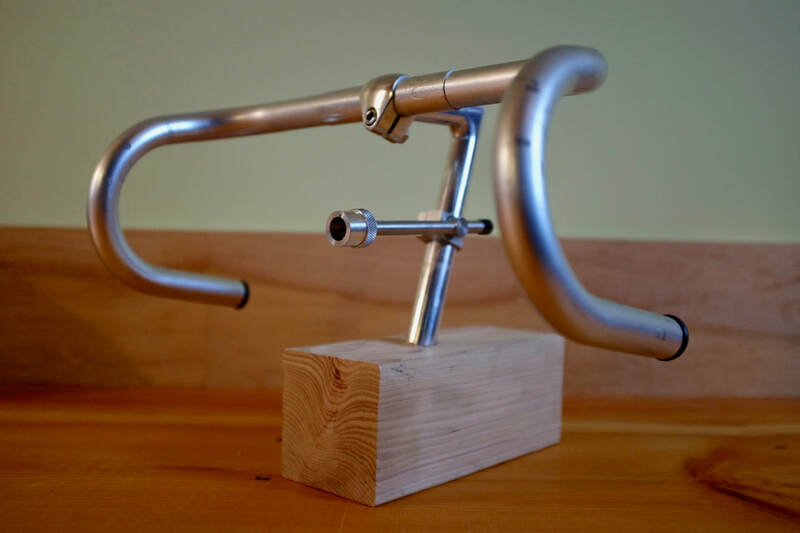 For frame builders and those with brazing and metal working skills, the Dock-It™ Kit will likely be all thats needed to get going, allowing a unique opportunity to fit the mechanism into the overall design. For more specifics go here. Stem mount with "hockey stick"
For those of you who want ready-made options to augment the Dock-It™ Kit for your buildout, we offer the following components and parts to facilitate your set up. On the other hand, you might want to just get rolling! 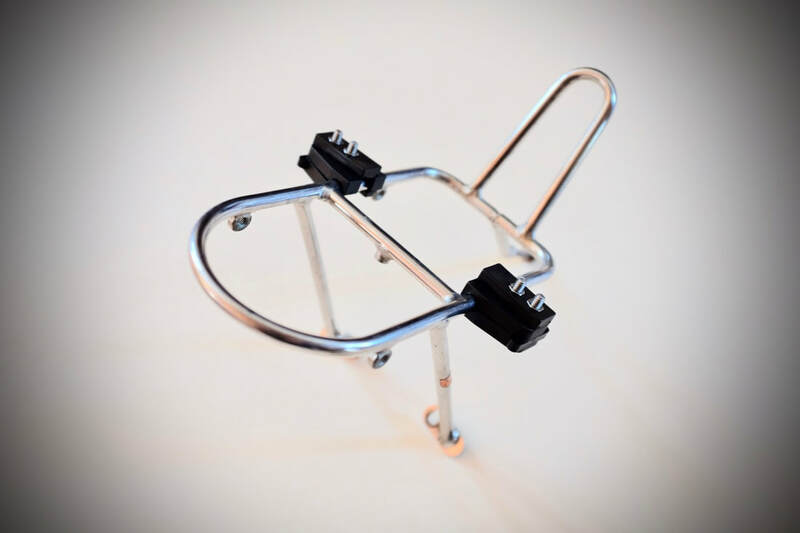 ​In that case we offer the Barrel-to-Bike (B2B) hardware that offer multiple options for mounting the Dock-It™ to your bike without too much work on your end. 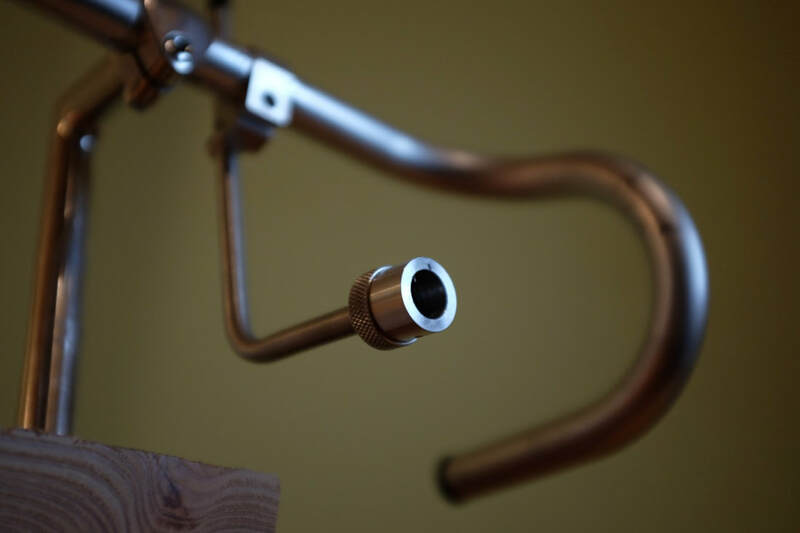 The B2B contains a beautifully finished stainless mounting clamp and a stainless tubular strut that together mount to the handlebar or threadless stem stack along with a optional shim allowing mounting to a quill stem. The other end of the tube is fixed to the Dock-It™ barrel. The strut provides nearly limitless possibilities for positioning the Dock-It™. Get more details here. First and foremost, decaleurs are stabilizers. Their job it is to hold the bag in place and resist sway, jostling, and lift. In this respect, the Dock-It™is an impressively strong connector. The next link in the system is the structure within the bag. We've assembled various ideas on how to mount the Dock-It™ button to the bag, including offering pre-cut aluminum plate to use in your bag. The bag plate is offered in centered and off-centered alignments. There's no fancy finish here since it'll be buried where no one will ever see it. ​Once you decide where your Dock-It™ will meet the bag you can drill and mount the button accordingly to meet the barrel. We envision placement of the support bracket for the button within the bag, maintaining a neat and uncluttered exterior. Custom designed and configured bags are available via Dock-It™ partner Waxwing Bag Co. Full details can be found here.